Used for warming needle head moxa. 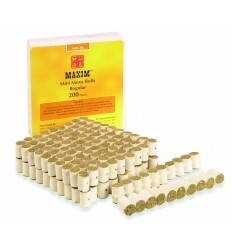 This 1.1cm x 1.6cm firmly packed pure moxa mini roll yields approximately five minutes burning. Just fit needle handle into the hole and squeeze the roll lightly for a tight fit. 200 pcs per box. Only to be used with needles that have a loop at the top of the handle. Please note, brand supplied may vary.